Basic calibration was done, using a pluge pattern, to set black levels. A white-on-white chip chart was used to set contrast levels. This is critical in any side-by-side comparison to ensure maximum contrast and maximum detail in both shadows and highlights. Color temperature was set to 6500 degrees by using the manufacturer settings. Weight: 16 lbs. 31 lbs. levels can be observed in this image. Once this was done, we began making comparisons in color, contrast and detail. This is where we were most curious and it was very interesting to see Optoma offer two versions of this projector. The UHD60 and the UHD65 both offer true 4K images but differ in color accuracy, frame interpolation, and contrast. Getting more accurate color in any projector, particularly a single DLP requires a trade off. In the case of the UHD65, they traded a little brightness (700 lumens) for better color – and it shows. The colors are rich, saturated and accurate, and they are very close to the Sony VPL-VW365ES – which was a real surprise for us! They have done a very nice job in getting the colors right. 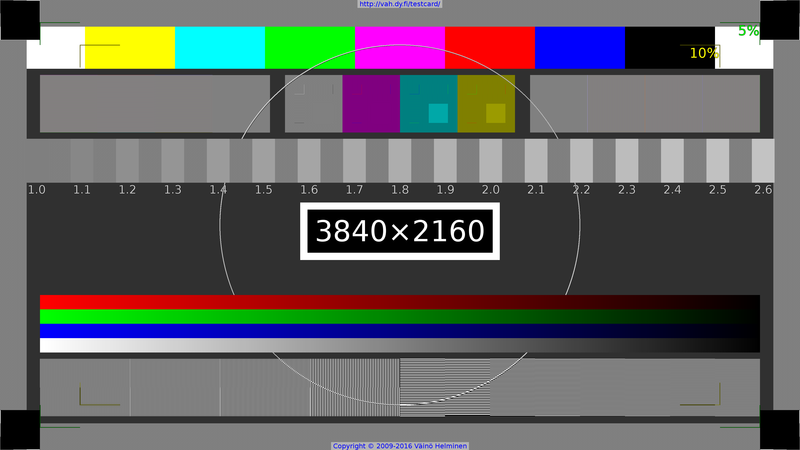 If a detailed color calibration with white balance was performed, they would be even closer. The Sony, however, still has a very slight edge in yellow saturation and reds. If you look closely, you will see a very slight difference in the intensity of the top yellow banner and the deeper red on the rim of the ball cap on the right side. If you did not have these side by side you would think they are the same. Very impressive for it’s price range! Both have excellent color, the Optoma is the first (under $10,000) true 4K UHD projector to be in this league of color quality. One final comparison on color was skin tone. Even slight variations in white balance will affect skin tone. In this case even though the presets for 6500 degrees did not match each other, they both reproduced skin tone very well. Technically, either one could be calibrated to better match true 6500 degrees and they would come even closer. In this case, they both reproduced very pleasing tones and any preference would be up to the individual. though the preset D6500 degrees white balance settings did not match. Note: To better compare the detail later on, we flipped the image on the right so that as we zoom in, we would be seeing the same part of the image. This is the same mode as if you would be projecting on a rear screen and does not affect the image quality. Side-by-side comparison of detail. Note: The camera shutter captured part of the color wheel cycle on the UHD65, which was not visible to the eye. Please disregard color difference in this image – it is used to evaluate detail only. Here’s a closeup of the image above with the center top enlarged for examination. After comparing both 60p 4K UHD and 24p 4K UHD source material there is no question that this Optoma UHD65 is indeed delivering 8 million pixels to the screen. The detail was crisp, sharp and very comparable to the Sony. The Sony, however, did reflect better contrast and black levels. This does affect our perception of the overall image as it tends to have more depth and help makes the detail pop a little more. The Sony, at approximately three times the price, should after all, be better, but the Optoma is a very close second and absolutely amazing for the price. Sony clearly has better blacks and brighter highlights. The Sony VPL-VW365ES is in low lamp mode and the Optoma is in its Highest. Good blacks and high contrast is one of the most difficult and challenging aspects of any projector design. Each projector has a black threshold at which point no amount of menu adjustment will make the blacks darker. If you go below the lowest pluge bar you will begin to crush or eliminate detail in the black areas of the image. Sony has chosen to use its Silicon Crystal Reflective Display (SXRD) reflective LCD chips in the VPL-VW365ES in order to achieve this level of blacks. This is why the Sony costs considerably more than the single DLP designs like the UHD65 – but the Optoma projector is a noticeable and impressive level of contrast in the under $8,000 price range. The Sony is the best contrast we have experienced in a projector under $10,000 with true 4K or UHD 4K. We use it as our home theater reference projector for projectors costing under $10,000. blacks and intensity of highlights without losing color. Semi closeup of Sony on left and Optoma on right. Slight tone variation is due to the presets of D6500K not being exactly equal but still had great color overall. Notice the differences in blacks and intensity of highlights without losing color. Close up – both amazing. 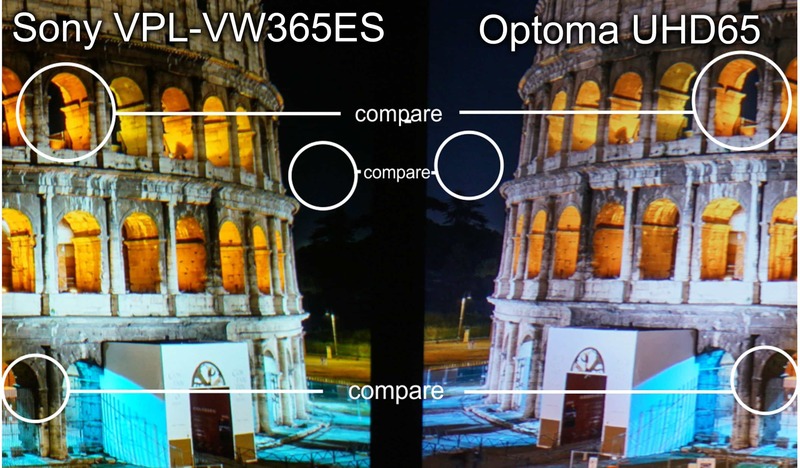 It should be noted that the Optoma was compared in its “Reference” picture mode and D6500 setting in order to deliver the most accurate and visibly best color output. It certainly has higher light output modes but they all compromise color saturation and accuracy. In addition, we did not do any detailed technical measurements as they can easily be found elsewhere online. We wanted to see first hand and record the visual results so that others may understand and see as well. Lastly, we did not compare the feature sets and special features of each projector as we feel this will be done by others. All of the images and comparisons were done with the new production version (not a demo model). Another clarification, some of you may be confused or not understand why the Sony, which is rated at 1,500 lumens, appears brighter than the Optoma which rated at 2,200 lumens. Let me clarify, it’s all about what the brightness is at what quality of color, in other words a manufacture usually rates a projector at its maximum light output even if the color is not really the best or in some cases not even usable. In this case, if you put the Optoma to its brightest image output mode “Bright” (not to be confused with its lamp setting “Bright”) the image is very green and skin tone is not very usable or realistic – but it can approach over 2,000 lumens. When the image mode is put at “Reference” the brightness drops to around 1,000 lumens but the color is very good and accurate. The Sony rates its home theater projectors at a more realistic level of color reproduction so at 1,500 lumens its color accuracy is still very good. That is why the Sony, rated at 1,500 lumens, can produce a brighter image than a projector, in this case, rated at 2,200 lumens. This entry was posted in AV Solutions, Home Theater and tagged 4k, 4K E, 4k Enhancement, 4k enhancement technology, home theater projector, Optoma, Optoma Projector, Optoma UHD65, Optoma uhd65 projector, projector comparison, Sony, Sony projector, sony vpl-vw365es, sony vpl-vw365es projector, UHD65, VPL-VW365ES. Not that it justifies such a higher price but it should be noted that the Optoma only provides flat 2d images while the Sony adds 3d capabilities (As do all of their new 4k pjs.) For many, any 4k pj w/o 3D is a downgrade. I’ll wait for the Sonys to drop in price. That is correct, the Sony has both 3D and faster response time for gamers. The new Sony VPLVW285ES just now shipping is $4,999. If you need 3 D that is a great way to go. Thank you for your excellent reviews! This is an exciting projector. It would be interesting to see a test pattern displayed on the Sony VPL-VW365ES and the Optoma UHD65 to compare their visible resolution for us pixel peepers. Maybe from a computer input? 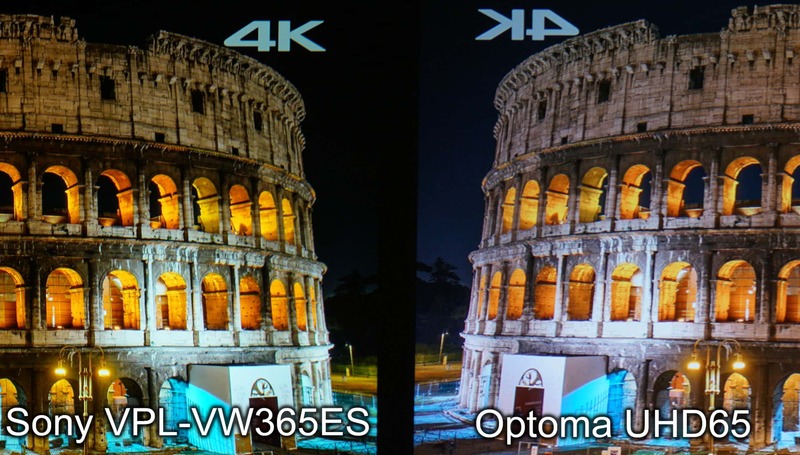 There is some debate about whether or not pixel-shifting projectors like the UHD65 are actually displaying a 4K image (3840×2160 or 4096×2160 pixels) compared to projectors with panels that have a native resolution of 4K like the Sony VPL-VW365ES. From what I’ve read, the Optoma is actually displaying a true 4K image even though it’s using pixel-shifting but it would be nice to see confirmation of that. It seems pretty clear from your reviews that the Epson projectors aren’t producing the detail of the Sony or Optoma but I’m curious to see if the Optoma is displaying the same number of pixels as the Sony. Even though perceived resolution is also affected by contrast and color saturation in addition to pixel density and sharpness, it would be helpful to just see the resolution differences if there are any. You are welcome, yes, we are working on that, we hope to find a 4K Blu Ray test patterns at CEDIA next week as any other signals are not component HDMI. 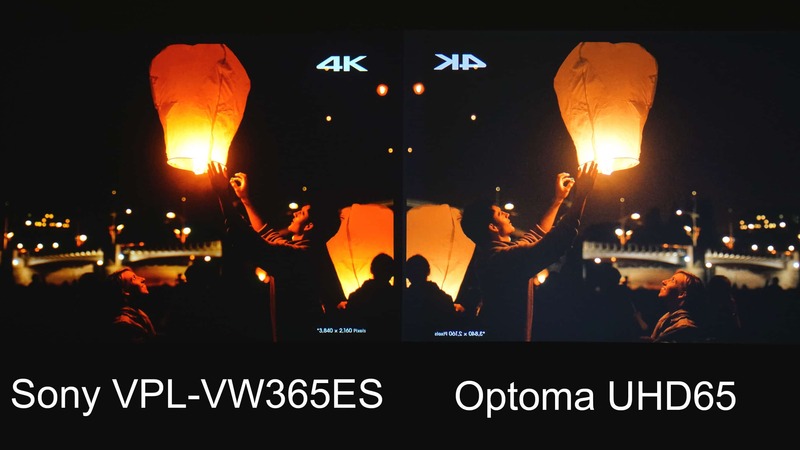 We did do a close up comparison of a native 4K UHD OLED and compared it to both the Epson and the Optoma. 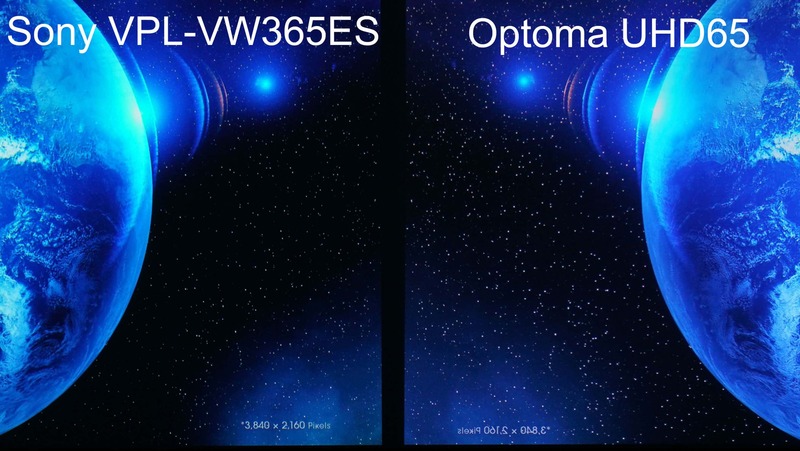 (see the UHD65 vs UHD60 blog) We can say the Optoma is so sharp and detailed it is difficult if not impossible to tell its 8.3 million addressable pixels vs both the Sony 4K OLED and the 365ES native 4K projector. Hope to have a test pixel by pixel pattern in 4K Blu Ray soon. I connected the HDMI-out of a mid-2016 MacBook Pro 15 to the TV, set it up as an external monitor (not mirroring, so it would output 4K), then displayed the test .png image with the default image viewer (just double-clicked the file to launch it in Preview) and expanded it to full screen so it was mapping the pixels one-to-one. It’s a little hard to see on a 65″ TV because the pixels are so small, but looking really closely I could distinguish the single pixel lines. A magnifying glass or camera would help. I understand, so keep in mind that a computer HDMI signal is RGB 4:4:4 where as 4K Blu Ray is HDMI component 4:2:0 at 10 bit. We have compared the 365ES to the UHD65 on my UHD laptop HDMI and the Optoma is absolutely as clean and sharp on text as is the native 4K Sony. That is what prompted these comparisons. Even though there is widespread debate on if the TI chip is really putting 8.3 million pixels, we would suggest you compare it in a side by side before you decide. The other thing we did not expect was the viewable contrast in a given scene. The Optoma UHD65 competes well in all but the darkest of dark scenes (ones with very few highlights) and we will soon (September 14th) find out if the UHZ65 can even go one step more in terms of the deepest blacks. We do appreciate your comments and interest, thank you.